« Summer reading and peace planning! Working with artist Abbey Thornton our friends at Quaker Peace Education have produced this excellent poster highlighting some of the many examples of Everyday Militarism that we encounter day-to-day in Britain and its effects on British life. It is a great way to spark off conversation about the roots of war and the kind of society we need to build peace and is suitable for use with children or adults. 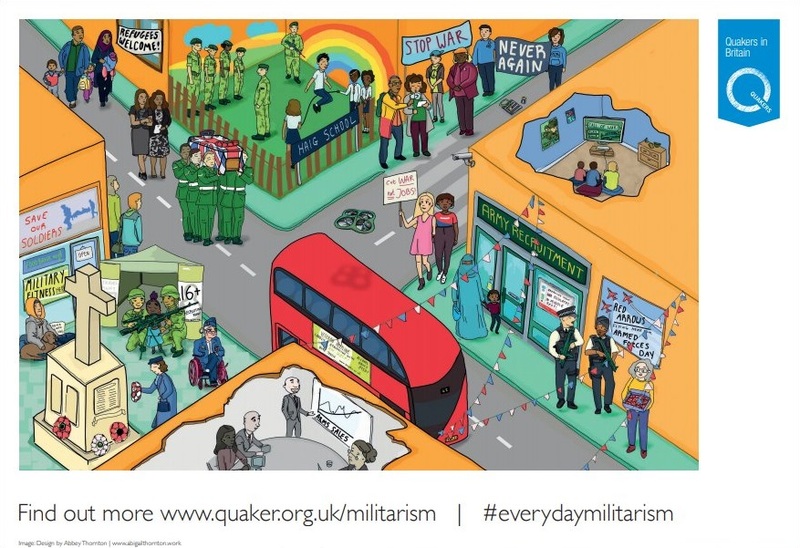 The poster can be downloaded here or ordered from the Quaker bookshop (free plus p&p). We also have a stock of the posters in the Pax Christi shop so you can order directly from us. Click to explore an interactive version here. Alongside the poster is a set of ideas for learning and discussion activities which can be downloaded here.